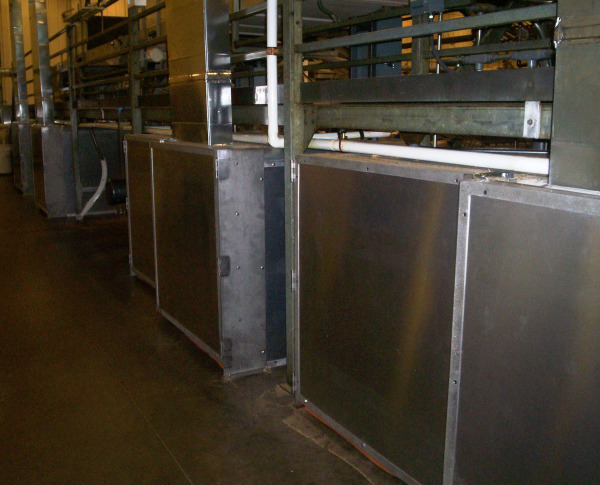 By installing Acoustiblok All Weather Sound Panels around four extremely high decibel vacuum pumps, a Wisconsin-based pizza crust manufacturer brought noise levels down to levels below OSHA standards – low enough to protect the hearing and health of staff working around the pumps without requiring industrial earplugs. 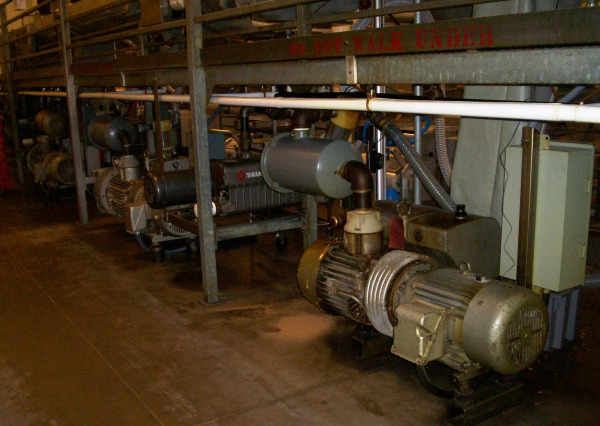 GREEN BAY, Wisconsin, August 8, 2011 – A Green Bay pizza crust manufacturer has installed Acoustiblok® All Weather Sound Panels around four high decibel, industrial vacuum pumps to bring noise levels in their plants down to OSHA demands. Alive and Kickin’ Plant Engineer Dennis Dolski said the original intention was to find a product that would reduce the high noise levels that were making working conditions unbearable for employees who worked within 10- to 30-feet of the plant’s 90- to 95-decibel vacuum pumps, which operate 24 hours per day, six days per week. 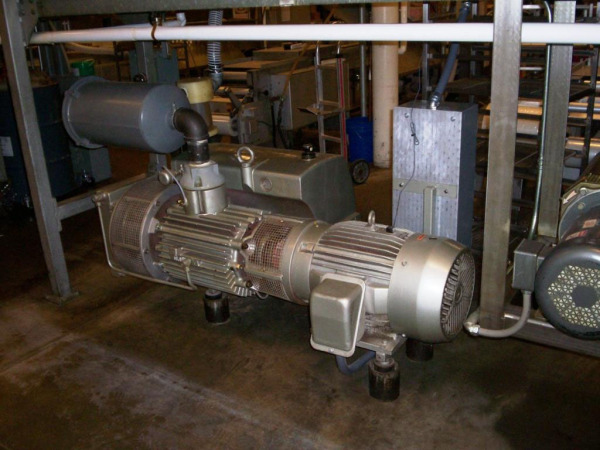 With advice from Acoustiblok consultant Jay Boland, Dolski said that they used Acoustiblok’s four- by four-foot and four- by eight panels to create enclosures around each vacuum pump, allowing fans to be installed in the bottom of each unit for ventilation. Port City Bakery, Inc., parent company of Alive and Kickin’ Pizza, hired Loss Control Consultant Dan Dudly of West Bend Mutual Insurance Company to conduct sound level meter testing of the vacuum pumps after the Acoustiblok All Weather Sound Panels were installed, with calculations done in accordance to OSHA guidelines. According to Dudly’s report, measurements were made utilizing procedures outlined by the American Industrial Hygiene Association (AIHA). Readings were taken on the A‐scale, slow response network defined by ANSI S1.4 for Type II sound level meters. Noise level measurements were obtained using a Quest Electronics Micro‐15 / set in the integrating sound level measurement mode. The meter was calibrated both prior to and following use, with a Quest Electronics QC‐10 calibrator. The integration time was set at one second. In fact, the noise levels were reduced to a measurement of between 70- and 79- decibels (representing a 75-percent reduction in sound to the human ear) Dolski said, depending on the amount of ambient noise coming from other parts of the plant. 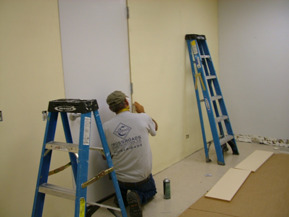 “By taking matters into their own hands and hiring a loss control expert to help them get their plant’s noise levels well below OSHA standards, Alive and Kickin’ Pizza and its parent company, Port City Bakery, are a model of excellence and responsibility when it comes to employee safety and health standards in the workplace,” said Lahnie Johnson, founder and president of Acoustiblok, Inc.
Acoustiblok All Weather Sound Panels are engineered specifically to withstand the most rigorous outdoor and industrial environments. Water, moisture, humid salt air or salt water, dirt, dust, UV, chlorine air, corrosion, and most harsh chemicals are no problem. Acoustiblok's All Weather Sound Panels, for use indoors or outdoors, are washable, durable, long lasting and usable in hundreds of areas and applications. 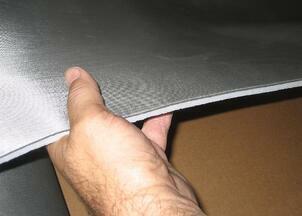 These panels have an unprecedented noise reduction coefficient (NRC) of 1.00 (Riverbank Acoustical Laboratories test results), and are the only noise barrier wind-load tested to 270 mph. Rigid and self-supporting, they can be used like building blocks to permanently or temporarily enclose any noise source, such as chillers and industrial machinery. For more information or to view a video demonstration of Acoustiblok’s sound deadening capabilities, visit the website at www.Acoustiblok.com, email sales@acoustiblok.com, or call 813.980.1400.